The Chauvet LX5 LED Moonflower Effect Light 2-Pack Kit by B&H is a dual multicolored, rotating-light effect system ideal for dancefloors, mobile DJs, bars, and more. 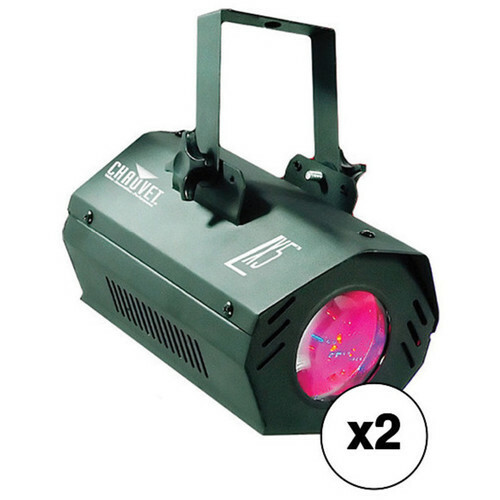 The LX5 features ultra-bright LEDs to create a dazzling moonflower effect. The LX5's selectable sound-active, rotating, and static modes allow for audio-controlled and internal operation. The LED bulbs emit low heat. A hanging bracket is included for easy installation. The Chauvet LX5 LED Moonflower Effect Light is a multi-colored, rotating lighting effect ideal for dance-floors, mobile DJs, bars and more. The LX5 features ultra bright LEDs to create a dazzling moonflower effect, and the LX5's selectable sound-active, rotating and static modes allow for audio controlled and internal operation. LED bulbs emit low heat so there are no duty cycles to monitor. A hanging bracket is included for easy installation. Box Dimensions (LxWxH) 10.3 x 7.5 x 6.7"